The Yellow Vest movement has taken to the streets across France for a 9th week of anti-government protests, as the Gilets Jaunes movement appeared to surge in both number and intensity. While the demonstrations were largely peaceful for most involved, there were several violent skirmishes with police. Some 80,000 officers were deployed across France, deploying tear gas in major urban centers such as the Parisian Arc de Triomphe monument. Le peuple se fait gazé, frappé, il y en a qui ont des sequelles à vie à cause des CRS, mais vous chouinez car un boxeur a frapper un flic? Et en pus de ça vous donnez 1m € aux fdo? Protesters came out en masse in Bordeaux, where a man was shot in the head with a with a flash-ball round and police deployed a water cannon (h/t @Steph_Roy_). 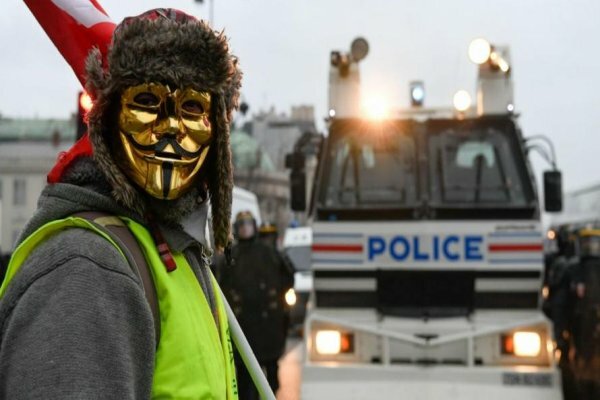 #Bordeaux Très rapide retour au calme à la demande de nombreux gilets jaunes.